The house was still and bitterly cold Saturday. 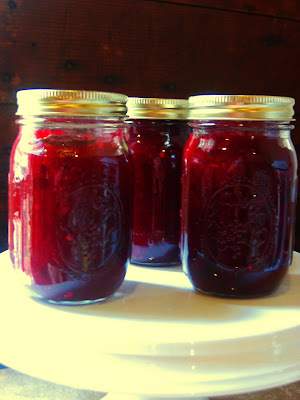 I made Cranberry Jalapeno Jam. It seemed the only thing to warm up the kitchen. It seemed the only thing to get me in the Thanksgiving spirit. It turned out to be just the thing. Cool upside down, then invert and check for good seal. Jam keeps about a year in cool, dry place. Here's why I love this jam: it's ridiculously simple. It's beautiful. And if you can handle the jalapeno, it goes on everything. Eat it with Thanksgiving dinner. Serve it up on turkey sandwiches. It's great over cream cheese with crackers for simple party food. It sings on bagels, toast and English muffins. And alongside roast beef, pork loin, chicken or lamb? Forget about it. Delicious! Aussies don't celebrate Thanksgiving but you are giving me a reason to want to. Lucky I live with a million Americans in the middle east who I can perhaps smuggle into one of their celebrations...only if armed with one of these recipes! Wow! Sounds amazing. I'm no chef, but I might give this a whirl! I'm making peanut butter bon bons because my sis in law says I can. We shall see. Thanks for the idea. P.S. I have already started on my first bottle of your beautiful Cranberry Glogg - it's lovely with fresh cranberries smushed in and topped with a little bit of real lemonade! I know I am not supposed to be drinking it yet, but the jar cracked, honest! Your jam sounds delicious! 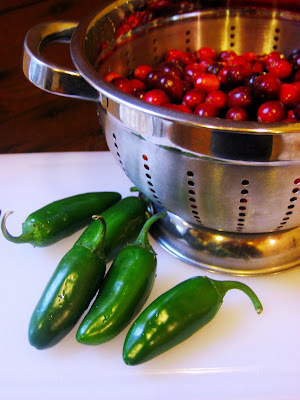 I love making fresh cranberry relish. I'm not much for putting orange rind in it...I use fresh cranberries, dried cherries, sugar, and water. So easy and so good. Also wanted to let you (and everyone that reads your blog) that I received my apron toolbelt a little while ago and it is adorable!! Girls, if you haven't ordered one yet, you really should. I plan on ordering several more! I wish we were neighbors. I would sneak over and grab a taste. I think this sounds heavenly. I found cranberry horseradish the other day at the grocery store and was in heaven! Thanks for the recipe. Made several jars this evening. Turned out great! Tastes so yummy. Will make great gifts for Christmas. One jalepeno is so not enough...I did 5 nd it still wsnt very spicey...it needs 7 or more. Hi, this recipe sounds sooo easy! One question: no pectin added? 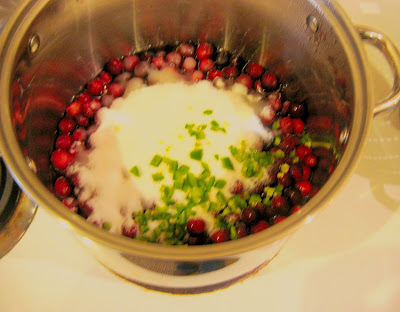 Is it thick enough with the cranberry chunks that it doesn't need pectin? Hi Jo! Nope, no pectin needed if you boil it until it passes the spoon test (or is thick enough for your liking). I usually add sugar until I get my desired consistency. :) Happy Thanksgiving!